With the main focus of his practice in the class action arena, Michael Farrell has significant experience as lead counsel in the defense of class actions, media-related litigation, and the defense and prosecution of complex commercial litigation. 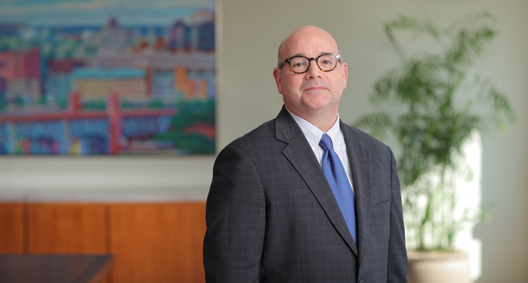 Throughout his career, Michael has defended clients in alleged class actions challenging insurance company claims practices; billing practices within the telecommunications and car rental industries; fax advertising; and defamation, invasion of privacy and related claims against print and electronic media outlets. Representing a manufacturer in two putative nationwide class actions in which plaintiffs assert, inter alia, claims for breach of express and implied warranties and state-law misrepresentation and failure to disclose theories based on alleged defects in vinyl siding manufactured and sold by defendants. Harney v. Associated Materials, LLC, et al. and Luckey v. Associated Materials, LLC, et al. Twice successfully argued the appeal of class certification before the Ohio Supreme Court and obtained a reversal of trial and an appellate court certification of class. Stammco, LLC v. United Telephone of Ohio. Obtained a reversal of a class certification in Ohio Supreme Court. Cullen v. State Farm Mutual Insurance Corporation. Obtained and affirmed a denial of class certification in trial and appellate courts. Augustus v. The Progressive Corporation. Represented numerous media defendants through discovery and obtained summary judgments in their favor. Reese v. WOIO, Morris v. WOIO, Roth v. WOIO, Sikora v. Plain Dealer Publishing Co. Represented a newspaper in a putative class action challenging delivery methods. Obtained summary judgment dismissing the claims and affirmance on appeal. Reddy v. Plain Dealer Publishing Co.